Latvian elections: what should we be voting for? The election is rapidly approaching and as Latvians in the diaspora, we should appreciate that for many Latvians living in Latvia the 27 years since independence have brought unwelcome as well as welcome changes and consequently in some quarters there is voter dissatisfaction with the whole political process. We should remember that voting in Latvia is not compulsory and that some will abstain or vote as a knee-jerk reaction because of disappointment with previous governments. So, it is particularly important that we inform ourselves and use our votes wisely. But how to make the choice? We should consider what the Latvian government should do over the next four years, in the economy, education, defence … and which of the political candidates might be able to achieve this result? Look at the leader of your preferred list of candidates and ask yourself whether you would buy a used car from this person … if he/she does not seem honourable, don’t entrust them with running the country! Personalities aside, there is another very important point to consider when making your choice. Latvia is recognised as a modern, democratic European country, which is expected to keep up with the advanced countries of the world. Latvia punches way above its weight in the fields of business and arts innovation. Unfortunately, we don’t have many politicians at this level. We have a string of popular and respected politicians, but many of these are still 20th century people with 20th century ideas, they are afraid of our contemporary open world and don’t know how to communicate with it effectively. For some, habits of mind and behaviour instilled during the Soviet occupation continue to shape political interactions. 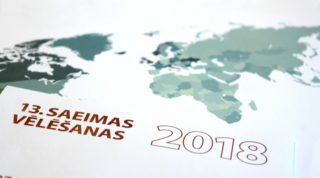 Latvia stands on the threshold of a dynamic four years – not only internally, but in terms of the next EU budget, the future of NATO, the relationship between the West and Russia, and similar critical policy areas. For this reason, it is important that the next Latvian government is made up of forward-thinking, educated young people who have the knowledge and will to work in 21st century conditions. To give the green light to the younger generation, we can use the Latvian voting system’s uniquely offered opportunity to mark a candidate with a “plus” sign or strike him or her from the list. Contemporary, forward thinking candidates can be found in almost all the lists and it is they who should be supported for the overall benefit of our country. We may be very fond of an experienced old horse, but we need a car to even think of entering the Grand Prix. To navigate the Latvian political landscape, I will use the subjective approach I have developed to guide my own decisions. The Latvian political landscape can’t be easily divided into “good” and “bad”. It can be described in two dimensions as “experienced” vs. “new” and “predictable” vs. “unpredictable”, so we can each make our own decision based on our priorities. We can understand those voters who choose to stay with the status quo. After all, the “Vienotība”, NA and ZZS coalition has, in the main, been in power since 2009 and has given Latvians some stability. Some negative aspects of this fragile stability are: Aivars Lembergs in the coalition, the OIK scandal over the corrupt funneling of “green energy” money, the lack of transparency in appointing solvency administrators. In short, the coalition has many faults. However, this government has put Latvia on a sound course that leads in the right direction – towards economic strength, integration into the EU and NATO, sustainable fiscal policies and more. This has been achieved at great cost, so it would be foolhardy indeed to allow its destruction by some barely hatched “saviours of the people”. Latvia has a lot to lose, we must be mindful of our choices. We can also understand those voters who have decided not to support the existing government. The current coalition seems to have lost drive, energy and capacity to govern. The most obvious example is the implosion of the once-great party “Vienotība”, brought about by internal conflicts, which has frightened off many of its supporters. The other two experienced parties – Nacionālā Apvienība and ZZS – have also suffered from corruption and other scandals. Therefore, perhaps it is indeed worthwhile to seek some new alternative – even if only to change the personalities in the ruling elite. It would not be reasonable to expect young people wanting to make a career in Latvian politics to join these stagnant old parties. There is certainly a case to be made for voting for young people. The “experienced” and “new” divide does not fall in the same place as the “predictable” and “unpredictable” divide. All the “predictable” parties may bend their rhetoric to interpret these values, but would agree that they are fundamental to Latvia’s future. On the other hand, the “unpredictable” parties have demonstrated by previous behaviour that they are quite capable of stepping aside from such principles for short-term gains. With “unpredictable” parties in power, anything could happen. Some would argue that risks need to be taken for the possibility of great future gains – but who would ultimately benefit? It seems unlikely that it would be the voters. If, for example, “Saskaņa” or KPV.LV were part of the ruling coalition, what would they do? These parties themselves have not given any clear indication. Are voters ready to take such a leap into the unknown? 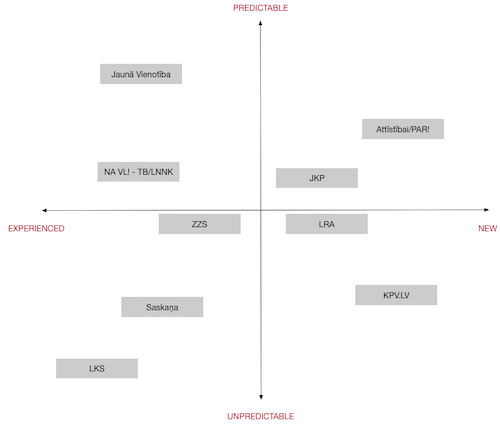 Using this two-dimensional model, the parties line up as shown in the attached diagram. Please notice that just because a party is experienced, it is not necessarily predictable (e.g. ZZS) and that some of the new parties are predictable, particularly with respect to their basic values. The subjective aspects of the diagram will, no doubt, be modified by each of you, according to your personal political inclinations. In the Latvian political system, a vote for a particular party is also a vote for the coalition that party is likely to form – no party has ever governed by itself. Therefore, the individual party programs should be taken with a grain of salt, they are more a list of aspirations than of policies. If your party gains a place in the ruling coalition, the government policies will be those agreed upon by this coalition. Coalition partners are carefully chosen. The hot topic in the press is what role the social-democratic party “Saskaņa” might take in a ruling coalition. Despite the media hype, there remains only a very small possibility that this might happen. However, we should be aware that the Artuss Kaimiņš scandal-riddled KPV.LV party has consistently avoided stating its position on co-operation with “Saskaņa”. This has caused a great deal of speculation. An example of this is the connection between KPV.LV and prominent politician and millionaire Ainārs Šlesers, who is a part owner of the newspaper “Dienas Bizness” which regularly supports KPV.LV and denigrates its opponents. However, although it is predicted that KPV.LV will fare well at the ballot box, it remains highly unlikely that it, together with “Saskaņa”, would constitute a majority. Political polls over the past month have varied widely in quality and methodology, which has been reflected in the vast array of pre-poll predictions. It seems certain that the next Saeima will include “Saskaņa” and ZZS, most probably as the two largest factions. It is highly likely that Nacionālā Apvienība VL!-TB/LNNK, Jaunā Konservatīvā partija and KPV.LV will also be represented. (KPV.LV has been touted as possibly receiving 5% – 15% of the vote.) The remaining parties are balancing on the 5% cut-off line: this includes the slightly refreshed “Jaunā Vienotība”, the liberal start-up “Attīstībai/PAR” and “Latvijas Reģiona Apvienība”. It is difficult to predict the results for these parties. A dark horse in the field is Tatjanas Ždanokas pro-Kremlin “Latvijas Krievu savienība” (LKS), which has popular journalist Andrejs Mamikins amongst its candidates. This party has not done well in the ratings, but its voter base tends not to disclose voting preferences, so it is not out of the question that “Saskaņa” may have a left-based rival. Taking into account the broad spectrum of political parties and ideologies on offer, it is conceivable that the next Saeima may be very fragmented. The current Saeima has representatives from 6 parties, the next one could potentially see representation of up to 9 parties. This could be a major stumbling block in the formation of the new governing coalition. Personalities, previous political history and pre-poll rhetoric will all have to be juggled by whoever is charged with forming the next governing coalition. Let us remember that the most unlikely coalitions can be forged into governments, as in the Saeima elections in 1995, when Andris Šķēle successfully managed a coalition consisting of 9 parties. Such a scenario is not ideal, but it can be workable for the day-to-day running of the government. The alternative of inviting “Saskaņa” to the table is not being realistically considered by any of the players. In the end, it will be decided by arithmetic – the result of the will of the people, in which we each play a part.